This article is also published at 'Covenant', the weblog of The Living Church, and can be found here. At the Bloxham Festival for Faith and Literature, 19-21 February 2016, the short list of six books for the Michael Ramsey Prize 2016 was announced. Two books each were introduced by three members of the shortlisting panel: it was made clear that they were not campaigning for these particular books, but were commenting on them. Alison Barr, Senior Commissioning Editor at SPCK, gave an overview of the prize and the books. The following is a development of my comments at the Bloxham Festival on the two books by Frances and Francis. This could win a prize for the longest sub title. The publishers, Faber and Faber, have even managed to squeeze it onto the spine of the book. (a) What kind of a book is this? 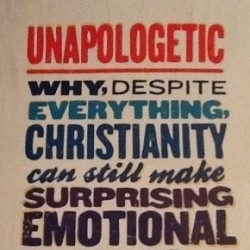 Well, unapologetically, it is a popular defense of the Christian faith from emotional sense and a presentation of the good news of Jesus Christ in the face of New Atheism. Spufford lectures in writing at Goldsmith’s College, University of London. He is a former Sunday Times Young Writer of the Year 1997, has edited two literary anthologies and a collection of essays about the history of technology. Interestingly this shows his interest in art and science interweaving. To use two denigrated words, which when combined provide profound interaction: this is very fine ‘theological journalism’. (b) Why should I read it? He has concise and profound footnotes on several key traditional subjects of apologetics: Bertrand Russell (pp.68-9); evolution and the response of the Church of England – at the end of which he suggests ‘‘If you’re glad Darwin’s on a £10 note, hug an Anglican’ (p.102); miracles (p.165); slavery (p.169). (c) Why has it been shortlisted? (d) Would it make sense for it to win the prize? Frances Young was previously Professor of Theology and Pro Vice Chancellor at the University of Birmingham. Amongst her many previous books are: The Making of the Creeds (SCM Press, 1991 and 2013) and she is co-editor of The Cambridge History of Early Christian Literature. This is moving ancient wisdom, applied to today, by a preacher, poet and leading scholar of Early Christianity. This book of systematic theology developed out of her acclaimed 2011 Bampton Lectures and is part of the Cambridge University Press series, 'Current Issues in Theology'. Her sermons and poems interweave with insights from art as she applies the wisdom of the fathers and mothers of early Christianity to issues of today. They speak across the centuries. There are chapters on creation, anthropology, incarnation, Christology, soteriology, Holy Spirit, church (including a discussion on Mary) and the Trinity. In the final chapter, she charts her movement from writing two chapters in The Myth of God Incarnate, edited by John Hick in 1977, as a young theologian, to her full trinitarian belief. Your mind will be stretched and your heart warmed. 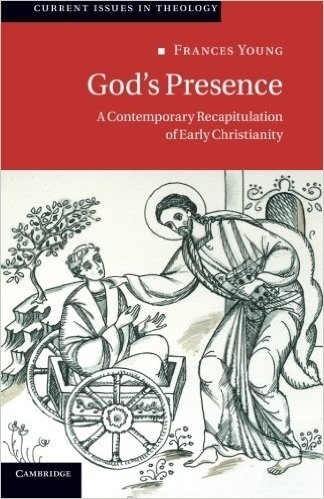 You will discover the extraordinary relevance of the early church to today's discussions. The drawing on the front cover of the book is by Silvia Dimitrova and depicts the loving friendship of Jesus for Lazarus understood as a person with learning difficulties. Lazarus’ chariot doubles as a wheelchair. She answers the ‘modern’ questions raised by John Hick and the other authors of The Myth of God Incarnate (including her own writings as a young theologian in Birmingham), concerning the divinity of Jesus Christ, by linking the development of two key concepts in Athanasius’s debate with Arius. I remember being struck by this insight, of orthodoxy having to present itself authentically by using innovative words, on first reading Rowan Williams’s major work Arius: Heresy and Tradition(SCM Press, 1987). In reading Young, it struck me that this, in effect, is the essence of the missiological concept of ‘inculturation’. The following section is headed ‘Defending the Chalcedonian Definition’ and she later proceeds to ‘Knowing the Unknowable as Trinity’. The heart of Christianity is a myth which is also a fact. The old myth of the Dying God, without ceasing to be myth, comes down from the heaven of legend and imagination to the earth of history. It happens — at a particular date, in a particular place, followed by definable historical consequences. Here are combined ‘thinking, acting and witnessing’. Here, theology, history and spirituality co-inhere. This book is thoroughly nourishing. Young echoes the thought of her beloved Gregory of Nazianzus, who ‘expected the mind of theologian to be stripped of pretentiousness' (p. 393). Her book is extraordinary in style, depth, coherence, lucidity, humility and fecundity. So, two books by Francis and Frances. I found them, respectively, popular and profound and profound and popular. They are very different in ‘register’ and ‘tone’ but similar in combining mystical experience with lucid presentation. Thankfully, others will be judging not just between these two, but between all the six books shortlisted. Dr Anna Rowlands, Lecturer in Catholic Studies in the Department of Theology and Religion, Durham University. They will announce the winner of the prize at the Greenbelt Festival, Boughton, near Kettering, on Sunday 28 August 2016. It would be good to pray for them: a firm foundation for that would be to buy and read for yourself one or two of these extraordinary books. C. S. Lewis, ‘Myth became Fact’, in C. S. Lewis, Walter Hooper (ed. ), God in the Dock: Essays on Theology and Ethics (Eerdmans, 1970). Currently, there are no moderated comments on this article.